You can use our equipment rental software to create Fuzzy Lists for streamlined rental management. 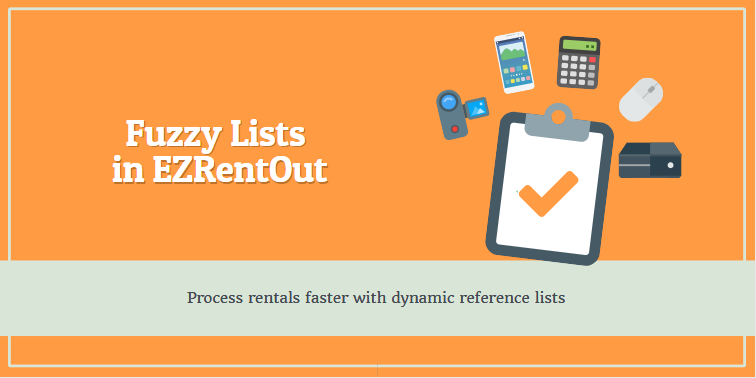 Think of these lists as dynamic reference points when filling out orders in EZRentOut. 1) When Would I Use a Fuzzy List? When Would I Use a Fuzzy List? A Fuzzy List is great for scenarios where you want to add a broad ‘category’ of items to an order – say a camera from the DSLR group – but don’t want to worry too much about which specific DSLR it is. You can draw up a list for reference, and have yourself or another user come back to the order and populate it with specific items as needed. This makes it a great placeholder system when booking and renting out items. 1) To start, Go to Settings → Add Ons → Fuzzy List → Enabled. 2) Next, create an order from Orders → Add Order → Choose a Customer → Create New Order. You can also go to any Drafted Order you’ve previously drawn up. 3) Now, click ‘Create Fuzzy List’ next to the Add Items search bar. ii) Asset (Advanced): This allows you to add a fixed number of assets with specific properties to the list. These can be assets having the same name, belonging to a certain group, or having the same model number. iii) Asset Stock: You can add a fixed quantity of an asset stock to the Fuzzy List. iv) Inventory: Similarly, you can add a set number of an inventory item to your list. 5) When you’re done with the list, click ‘Add’ to get things going. Your Fuzzy List will now pop up on the Order detail page, as shown below. 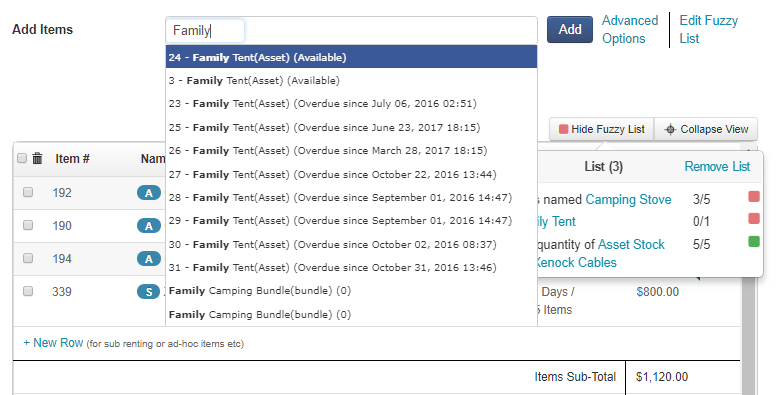 It lists down the items and quantities, and all you have to do is look them up from the Add Items search bar at a later date. Each order can only have a single Fuzzy List. You can toggle visibility for this by clicking the button highlighted in green in the image above. You can now use your Fuzzy List as a reference point for adding items to an order. Go to the paragraph on Order Assignments to learn more about how another user can populate an order using the Fuzzy List you’ve drawn up. The colored checklist icons next to an item on the Fuzzy List will turn from red to green once those items are added to the order. You can see that in the example below, only 3 of the 5 Camping Stoves on the list have been added to the order. This is why the checklist icon is still red. Adding 2 more Camping Stoves will turn it green, signalling that all the items on the Fuzzy List have been successfully added to the order. This can be a great way to attach placeholder items to an order, and have another employee fill the order when there’s a need for it. You can edit or remove your Fuzzy List by clicking the options highlighted in green below. Editing allows you to add or remove items or quantities on your list, and removing a list will do away with it entirely. And that’s all you need to know about creating Fuzzy Lists for reference using our equipment rental software! This entry was posted in [Support] and tagged checklist, dynamic list by admin. Bookmark the permalink.